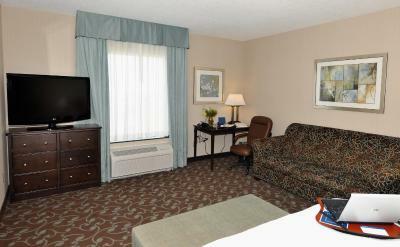 Lock in a great price for Hampton Inn & Suites by Hilton Brantford – rated 8.8 by recent guests! Overall a good place to stay at reasonable cost. The owner is building an other hotel right beside the Hampton. wonderful breakfast clean comfortable pillows and bed. We always like the location which is very close to family. We totally enjoyed our stay and will will come again. They have a reception every week night for the guests with free food and drinks! I always have a handwritten welcome letter and bottle of water waiting in my room for me. Friendly staff and nice new rooms. This was our second visit there for a dance competition downtown. We travel a lot for competitions and I have to say that both times our experience staying there has been amazing. For the price, the beds were comfortable and breakfast was fantastic. I am gluten intolerant and there was even some food for me there to eat! We really enjoyed our visit and the staff are super friendly too. We will stay there again if we are back in the area. close to the nearing town , staff were friendly and new the area well. Hampton Inn & Suites by Hilton Brantford This rating is a reflection of how the property compares to the industry standard when it comes to price, facilities and services available. It's based on a self-evaluation by the property. Use this rating to help choose your stay! The Hampton Inn & Suites by Hilton Brantford is a nonsmoking hotel offering a free hot daily breakfast. Free WiFi is available throughout. Every room includes a flat-screen LCD TV with HD channels. Additional room amenities include a microwave, mini-refrigerator and coffee maker. A complimentary, light evening dinner with drinks is served from Monday to Thursday at the Hampton Inn & Suites by Hilton Brantford. A fitness room and indoor pool are on site. For added convenience, the hotel has coin laundry facilities and a 24/7 convenience store. The hotel is a short distance from The Sanderson Center for the Performing Arts (5 mi) and The Alexander Graham Bell Homestead (6.8 mi). African Lion Safari is 30 minutes' drive away. This property is also rated for the best value in Brantford! Guests are getting more for their money when compared to other properties in this city. When would you like to stay at Hampton Inn & Suites by Hilton Brantford? This spacious studio offers a sofa bed, a flat-screen LCD TV, a microwave and mini-refrigerator. Features a sofa bed, a coffee maker, a flat-screen LCD TV, a microwave and mini-refrigerator. Features a coffee maker, a flat-screen LCD TV, a microwave and a mini-refrigerator. This double room has a microwave, sofa and air conditioning. This room features a hot tub, a 40-inch LCD TV, free WiFi and a bathroom with a curved shower rod and complimentary toiletries. House Rules Hampton Inn & Suites by Hilton Brantford takes special requests – add in the next step! One child under 2 years is charged CAD 10 per night in a crib. Hampton Inn &amp; Suites by Hilton Brantford accepts these cards and reserves the right to temporarily hold an amount prior to arrival. Hampton Inn & Suites by Hilton Brantford accepts these cards and reserves the right to temporarily hold an amount prior to arrival. Coffee was very M strong! There really wasn't anything that we felt could be better. to many children in the pool unsupervised . It was hard to get the room cooler at night. The furniture layout was odd - everything pushed back against the walls to accommodate the pull-out couch. Bed was not very comfortable. The staff are always pleasant and efficient. No instructions in operating whirlpool tub so not able to use first night was frustrating. Not having the coffee supplies replaced after first night was annoying. The hotel is good, breakfast is terrible. Access to main road and side roads challenging. Hard to turn left. Parking lot is a mess and no parking in front of main entrance as all the spots are reserved for "diamond members" and were nearly all empty. So the "regular folks" have to park around the side and back, then walk all your bags in the freezing cold to the front. Make sure you dont' forget something in the car!